A member from the Oil Police Force is seen at Nahran Umran field norh of Basra, Iraq September 8, 2017. Picture taken September 8, 2017. 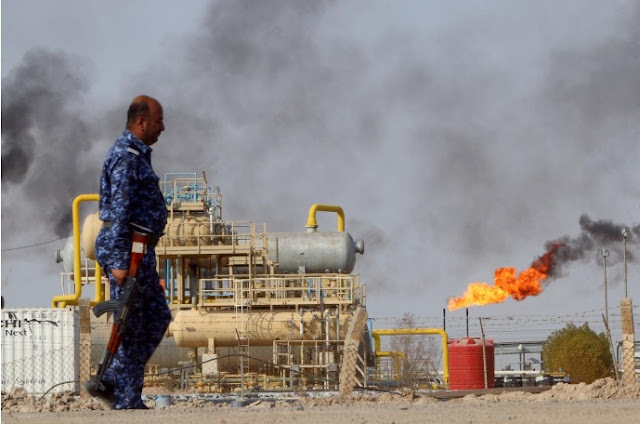 TOKYO - Oil prices rose on Wednesday after Iraq’s oil minister said OPEC and other crude producers were considering extending or even deepening a supply cut to curb a global glut, while a report showed a smaller-than-expected increase in U.S. inventories. U.S. West Texas Intermediate (WTI) crude futures were up 37 cents, or 0.8 percent, at $49.85 a barrel at 0226 GMT. On Tuesday, the contract declined 43 cents to $49.48. Brent crude futures were 25 cents, or 0.5 percent, higher at $55.39. They settled down 34 cents at $55.14 a barrel the previous session, not far off a five-month high of $55.99. “While there have been talks of extending the current production cut agreement, (al-Luaibi’s comments) suggest another 1 percent cut to production would be more effective,” ANZ said in a note. Nigeria’s oil minister and the head of Libya’s state oil company are likely to attend a meeting between OPEC and non-OPEC nations on Friday, two OPEC sources said. Both are exempt from the deal to curb output and their resulting boost to production has weighed on prices. This has prompted more talk about including Libya and Nigeria in the pact.